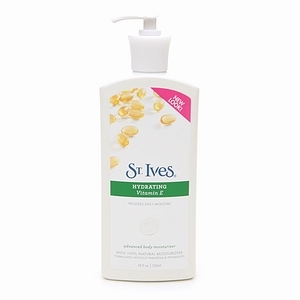 Drench your skin in nutrient-rich hydration with this St. Ives Hydrating Vitamin E Lotion. Packed with the powerful antioxidants of Vitamin E, this formula provides immediate moisture, while helping to protect against future dry skin. Apply daily to maintain hydrated skin that looks and feels soft, smooth and healthy. Not Tested on Animals. Does not contain animal ingredients. Bottle contains 20% post-consumer recycled material.